It’s said that the average American household has more than $8,000 in consumer debt, not including cars or homes. That’s a lot of money to owe other people, especially when you factor in month interest payments on that amount! There is no time like the present to make a decision to tackle your debt in 2010 and create a plan to actually do it. Jessica from Life as Mom is sharing the reasons her family wants to continue to live debt free, and she’s got some great reminders if you’re looking for motivation to pay off your debt. 1. Write down all of your debt. Open each credit card statement and write down the amount you owe as well as the minimum monthly payment. Next, add medical bills, family debts and any other debt obligation you owe. You must start with this step in order to have a clear picture of where you stand today. Although the results may shock or scare you, don’t let yourself be paralyzed by the amount of debt you have. Instead, let it motivate you to make the changes necessary to get out of debt before you sink even further. If you only have a little bit of debt, it may actually be harder to get motivated to pay it off, but let me encourage you to do just that. Without debt and the accruing interest, you can build your savings and live without the extra pressure of those monthly payments. 2. Choose a method for paying off your debt. There are several methods that people use to pay off their debt. To be honest, I’m not sure it matters which method you choose, as long as you consider what motivates you and will keep you moving toward your goal. Many, many writers throughout the blogosphere advocate Dave Ramsey and his methods, including his popular book, The Total Money Makeover. Not only do his methods make sense, but he is also inspiring and engaging, which helps motivate those who follow his plan to actually achieve their goals. Dave Ramsey advocates the snowball method, which Alyssa from Kingdom First Mom explains in more detail today. By starting with your smallest debt and paying it off first — regardless of interest rate — you’re able to create momentum as you pay off each one. Continue rolling your debt payments together toward the larger debts so that you’re able to knock them out faster. Other financial advisers advocate starting with the debt with the highest interest rate so that you’re eliminating that interest expense as quickly as possible. The downfall of this method is your highest interest rate may also be your biggest debt, which means you won’t get to experience the thrill of paying something off nearly as quickly. Some people prefer to increase their payments on all of their debts at once. With this method, you’re making progress against all of your debts at once, but like the second method, you won’t get to experience the emotional high of paying off as much debt along the way, which is what often keeps people motivated to keep going. Think carefully about your personality before choosing a method and then pick the one that you believe will work best for you. Remember that you can always change methods midstream if it turns out it’s not working the way you thought it would! 3. Brainstorm additional income opportunities. Look for an income opportunity related to something you’re passionate about so that you’ll stay motivated to continue working and paying off your debt. 4. Look for ways to cut expenses. As you increase your income, you should also be on the lookout for ways to decrease your expenses, which will leave you more money to funnel toward your debt. Some of these changes may seem like a sacrifice (giving up Starbucks?! 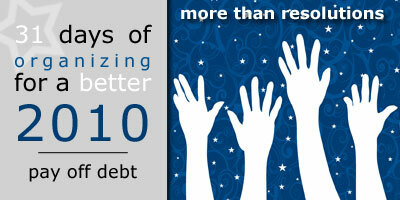 ), but living without the stress of growing debt is worth the sacrifice! This isn’t a financial blog, so I won’t go into much more detail here, but there are dozens of financial blogs to help you understand your finances, live frugally and stretch your budget. Here’s a list of the top 100+ to get you started! As Alyssa shares in her post, visually tracking your progress can be a huge motivational tool as you work toward paying off your debt. You might set up a white board like she and her husband did, or you might prefer a spreadsheet that you keep on your desktop and update every month. If you’re creative, you could even use illustrations to show how much you’ve paid off and how much you have left. Again, how you do it doesn’t matter nearly as much as simply doing it. It might be uncomfortable. It might make you want to curl up in a little ball and cry. But those are both much better alternatives to simply ignoring it and allowing it to continue to accrue. Do you have an inspirational story of paying off debt? Is it one of your goals for 2010? The 31 Days of Organizing for a Better 2010 series is sponsored by Get Organized Wizard. The Design Your Life e-program is a comprehensive self-improvement program that delivers ongoing structure, motivation and accountability for taking action.